People Counter: Increase Business Intelligence, counting people. Increase Business Intelligence, counting people. People Counter at a Glance! 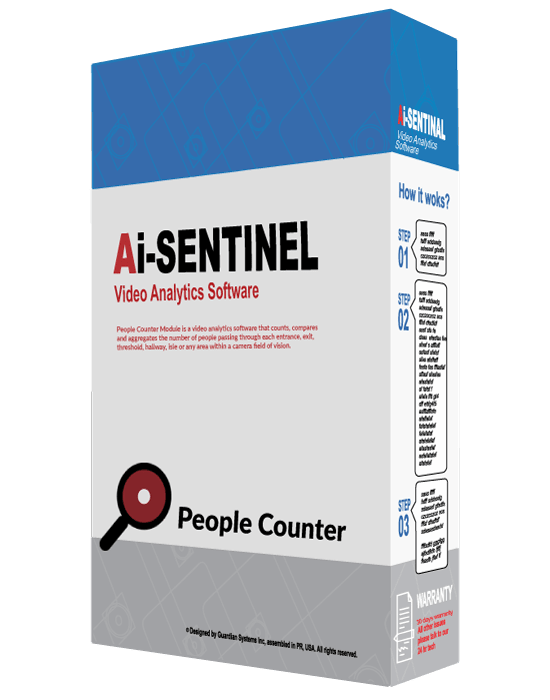 People Counter Module is a video analytics software that counts, compares and aggregates the number of people passing through each entrance, exit, threshold, hallway, isle or any area within a camera field of vision. Allow People Counter to help you know the behavior of your visitors. How, when, how long, and more? Ideal for retail, manufacturing, capacity counting, marketing analysis, malls, airports, and more. The system lets you pick and choose different areas from different cameras to gather the data needed. The business intelligence dashboard is tailored to show the data required by the user in friendly reports and charts. You can know the exact number of customers that entered and exited the store; average time inside the store; determine which entrances/exists have the most traffic, and at what time; compare traffic for different days and hours; compare the performance of different stores; and more. ¹Daily cost. Processing hardware, cameras, labor cost and other hardware are not included and can be quoted separately. Data transfer costs for notifications are not included are will be the sole responsibility of the client. ²Daily cost. Counter Reporting Platform is made to order with the specific data analysis reports required by the customer. Reporting platform may take 1-2 weeks to compile and confirm from order. Notification functionality may be included in platform parameters. *People Counter requires a 6-months software upgrade service. Can it add count from different cameras? Yes. You can configure different zones in the same camera field of vision, and add these zone counts or zone counts from different cameras. We created a personalized dashboard that shows only the data reports the User requires. We also show the reports in the manner the User likes and can be accessed remotely by the User at any time. What type of business intelligence data can the system collect? You can collect and determine any number of intelligent data to optimize your business, such as; number of customers entering, daily activity, peak times, flow patterns, rate of stay, capacity, conversion rate, and many more. You can configure the system to send automatic notifications for employee deployment and enhance the consumer experience, i.e. open a new cashier if the waiting lines are too long; deploy another waiter if there are too many customers, and more.